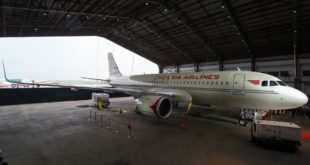 Vistara Airlines, Airbus A320 VT-TTB in its official livery. Photo courtesy the airline. 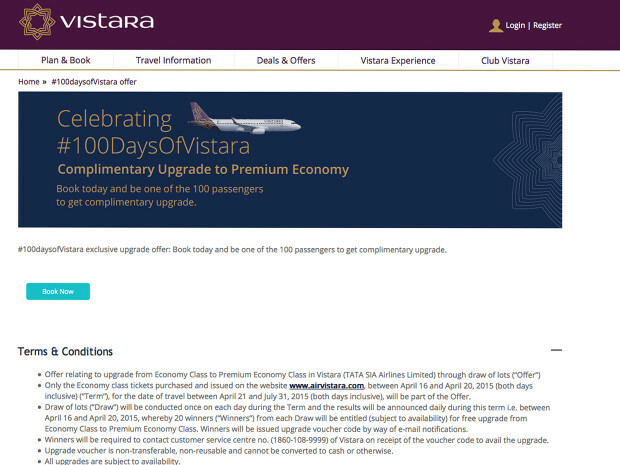 The Tata Singapore Airlines joint venture Vistara is offering 100 free upgrades from economy class to premium economy class to 100 passengers as part of its celebration of 100 days in operation. The upgrade promotion ends today. A chance for these 100 upgrades is available passengers who purchase tickets on its website between April 16 and 20 for travel between April 21 and July 31. All dates in 2015. Each day the airline will draw, at random, the names of 20 passengers who will be upgraded free of charge. The upgraded passengers will be issued an upgrade voucher by email and they must immediate contact Vistara customer service and avail the upgrade. The upgrades are subject to availability of seats. Visit the contest page for full details. Read our in-flight review of Vistara’s premium economy class and our exclusive in-flight review of Vistara’s business class. 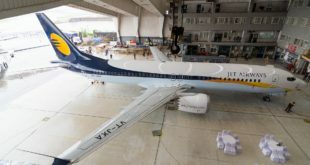 Previous Pictures: Jet Airways’ 737 landing gear collapses at Khajuraho. Airport closed.